Hi! I am having problems with air in my lines and infloor cleaning system not working. It started when I first noticed the cleaning heads not popping. A friend had a similar issue and thought the gears might be bad. I replaced the insides of the actuator but it would work for about 15 min when I first start the pump then the impeller would stop turning. I then started looking for another source to the problem and noticed air in the pump basket. I have tried the running water trick and thought possibly the drain plug was the culprit. I have replaced it and the problem remains. I cleaned off the o rings to the pump basket and leaf vac thinking I had too much old silicone glooped on and that actually made it worse. So according to a YouTube video it said you could test to see if an o ring is bad by putting on a bunch of silicone and see if it helps. I put a heavy layer of silicone on and it was better than when it was cleaned off but still some air coming in. Both the o-rings look fine but the one on the leaf vac seems maybe a little loose. Would you replace the o-ring next? On a leaf vac should it be filled to the top with water? It comes up to the inlet pipe but isn't filled entirely. Is it reasonable to think that the issue with the cleaner is related to the air or do I have two problems? Any guidance is appreciated! I would really like to understand what's going on. Also I have a pic of my setup but not sure how to post yet. What type of filter and what is the filter pressure? When was the last time you backwashed or cleaned it? Is that a VS pump, and if so what speeds are you running? It is hard to tell in the picture, but where does the suction pipe go? It looks like it goes into the ground? It looks like you are currently running with the Skimmer shut off, is that how you normally run? Does all your suction come through the leave vac, or can you shut it off? Does the pipe opposite the skimmer go to the main drain or where? Again it is hard to tell in the pics, but it appears that you have everything on all at the same time.. All your water features and the in-floor system. Is it possible to run without the water features and the in-floor to see how the system works then? Is that a flow gauge, and if so what does it read? A couple more pics from different angles would help also. I know, a lot of questions and no answers.. but I believe that one reason you have yet to receive an answer is that we need more info. Thanks, Jim! I wasn't sure what would be helpful. My filtration setting is 1000 rpms I believe and the cleaning setting is normally at 2800 rpms although I bumped it up to 3000 rpms to see if I could get enough flow to keep the cleaning heads moving. I attempted to clean it about a month ago but it was the first time I had done it by myself and couldn't pull the cartridges out so I hosed them down in the housing. The suction pipe does run in to the ground where if I am understanding correctly it connects to the bottom of the leaf vac so yes everything flows through there. The pipe opposite the skimmer is the line from the main drain. I have a quik skim so I was told I didn't need suction from the skimmer because it is functioning through a Venturi action. I did try fiddling with it tho and it didn't seem to make a difference. The water features I turn on and off at the panel or remote so they are not always running. Should I try shutting the valves too? I can't honestly say I know how or if there is a way to stop the flow through the cleaning system. The flow gauge reads about 30 when I have the pump running on "high" Which from what little I can find that is not fast enough to run the cleaner. I will take some more pics when the sun comes up in Phoenix! You have a suction side air leak. Additionally, it appears the return valves are set incorrectly for best infloor efficiency. Looks like you have suction from the skimmer and the main drain to the valve between the Leaf Vac and the pump. 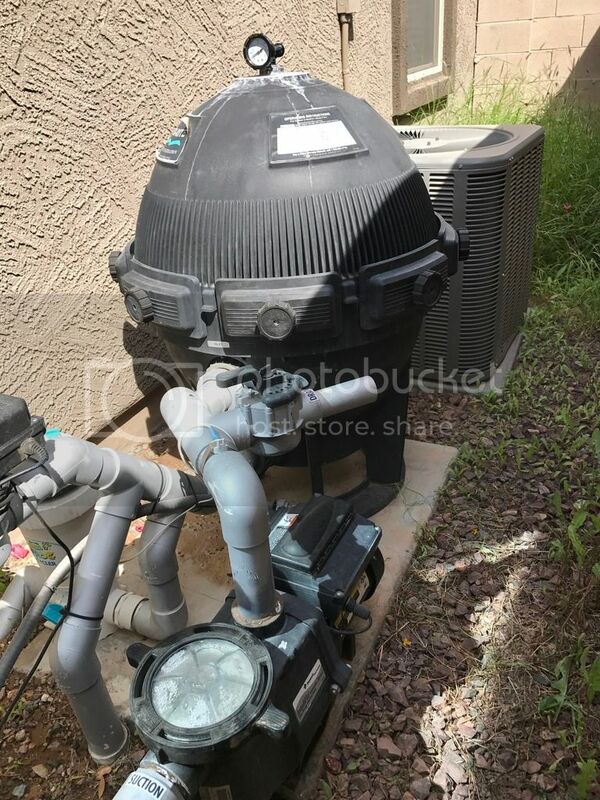 In your second pic, skimmer is off and all water is being drawn from main drain (that 3-way valve is different from mine, but it appears the skimmer is shut off). If you turn off the main drain and draw from only the skimmer do the air bubbles in the Leaf Vac diminish? After that valve, water goes to Leaf Vac. Leaf Vac outlet is underground and pipe goes from there to pump. That appears to be the older, original style, Leaf Vac. With pump off, open the top and carefully inspect for any cracking - espedially near the lugs that help hold the lid on. Cracks there will let air in. It does appear your are attempting to send return water to the water features and infloor at the same time. That's not going to work very well. The infloor needs a max amount of return water. The Quik Skim and Dek Chlor will use very little return water flow. What rpm are you running the pump at while trying to run the infloor? Edit: I see you were responding while I was composing my message. I wouldn't shut off the individual ball valves for each water feature. The 3-way valve before those should be able to isolate the water feature circuit. 1000-1200 rpm is fine for when you aren't needing full use of infloor. 2800 rpm or higher is needed to run infloor for cleaning. Each pool and system is a bit different, so it's difficult to give you a hard number for infloor cleaning use. It is totally fine to have water flowing thru the infloor, even at low rpm - they just won't perform their cleaning function very well. Do you know the manufacturer and model of the filter. Post up a couple pics and maybe someone can help identify it. The cartridges really do need to come out completely for cleaning and inspection. And the filter vessel needs to be completely cleaned out also. I'm not totally familiar with the Quik Skim function, but I believe it's usually better to draw from the skimmer more than the main drain - even when using infloor for cleaning. My main drain/skimmer valve is set about 40%/60% - but I don't have the Quik Skim. Hi Gene! I will try out isolating the water features with the three way valve. The box it is sitting on looks "electrical" to me so I was afraid to touch it. And I will have another look at the leaf vac lid. My leaf vac does not fill completely with water. The basket stays full but it does not fill up past where the inlet is. When infloor is running with pump on high speed, are the water features running at all? 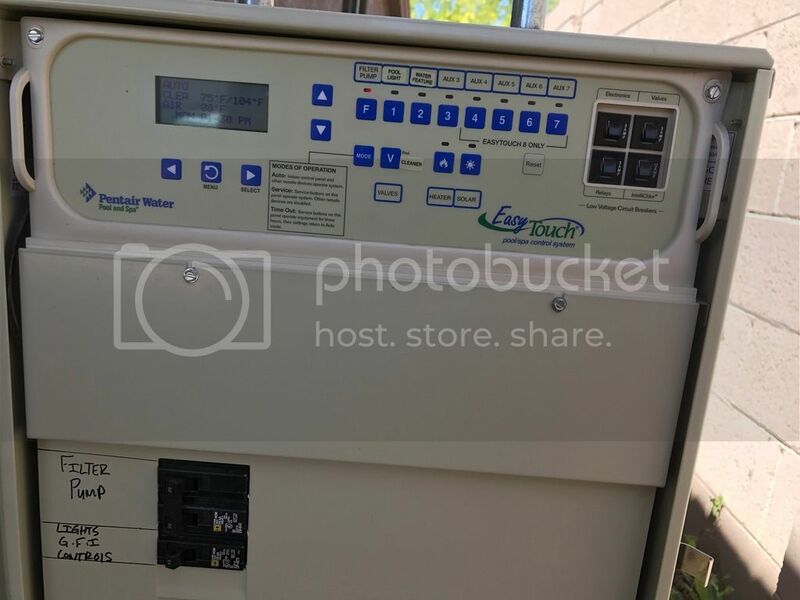 I'm not familiar with much pool automation, but I think you should be able to somehow command that electric valve to shut off the water features completely. Alternately, I believe you can remove the valve actuator - box on top of that valve - and use another valve handle on the shaft to manually isolate the water features. Just make sure you put everything back the way is was. Please post a few pics of your automation setup, filter pump and overall equipment pad setup. These, along with any manufacturer and model numbers will help us to help you. One of our automation gurus can help you better understand your setup - but it's difficult to do that if they don't knkw what you have. You do have a suction side leak somewhere. We just need to rule out items one by one to isolate it. Have you switched the skimmer/main drain valve to open up the skimmer to see if the air in the Leaf Vac decreases? In addition to running water over the pump and Leaf Vac lids, valves, etc. - you can put shaving cream around the joints and see if it gets sucked in anywhere (pump running, of course). Places it gets sucked in point to a suction leak at that point. Also, include make and model number of equipment in your signature. I'd suggest working on the suction side first. Once the air leak is fixed, you can concentrate on the infloor. I'm going to pile on and ask fo a picture of the filter and make and model. I would also replace the o ring on the leaf thingy. I am working on getting some pics added but I'm past my quota I added info to my sig - the filter is a Pentair sta-rite system 3 cartridge filter. Of note I tried to do a quick look at the leaf vac lid before work and when I pulled it was suctioned on pretty good and when I got it off the o-ring stayed on top of the basket rather than in the groove on the lid. This has never happened before, don't know if that's a sign the o-ring is too loose??? I am thinking I will replace it either way just to see but it was out of the ordinary so I wanted to mention. In this last picture your auto valve is in correct position. As far as the skimmer valve if you're satisfied with the skimming using just the quick skim feature then you can keep that valve closed. If you want a little more skimming crack open valve in front of leaf trap a little. I would definitely get those filters out to clean, you can't clean very good still in the tank. Since you have a flow vis you probably need closer to 60pm to run infloor system. Thanks, I'm going to work on getting the cartridges out tomorrow and replace the leaf vac o ring. Hopefully it will help! I've had the leaf vac o-ring stay on the base also. It's really not a big deal. You may not need to replace the o-ring. Finding where the suction side leak is and fixing the source may be better than throwing money at replacement parts you may not need. Have you tried the shaving cream yet? In the second to last pic, where do those 2 return lines just to the left of the pump basket lid go? And what's that white canister on the one pipe - maybe a Frogger? 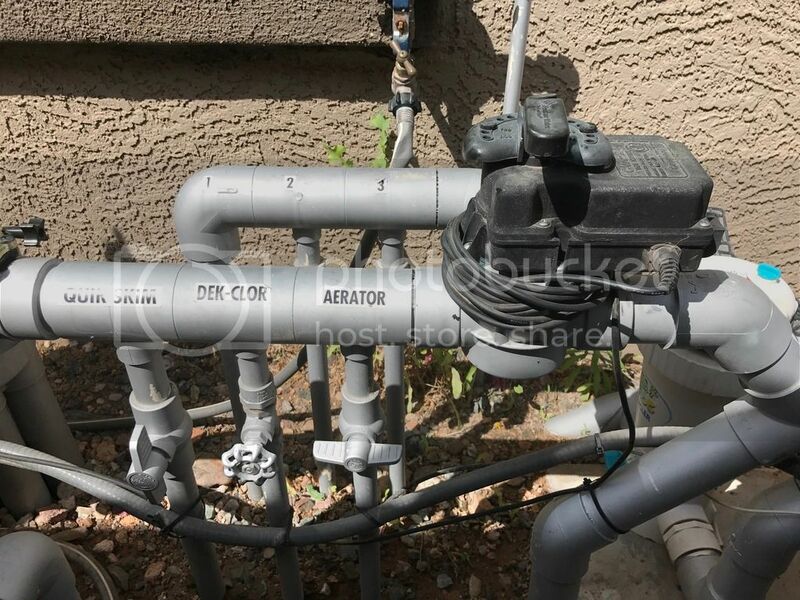 Are there any valve to shut off flow to those pipes? One or both of those return pipes could reduce flow to the infloor. It's not something TFP recommends using. 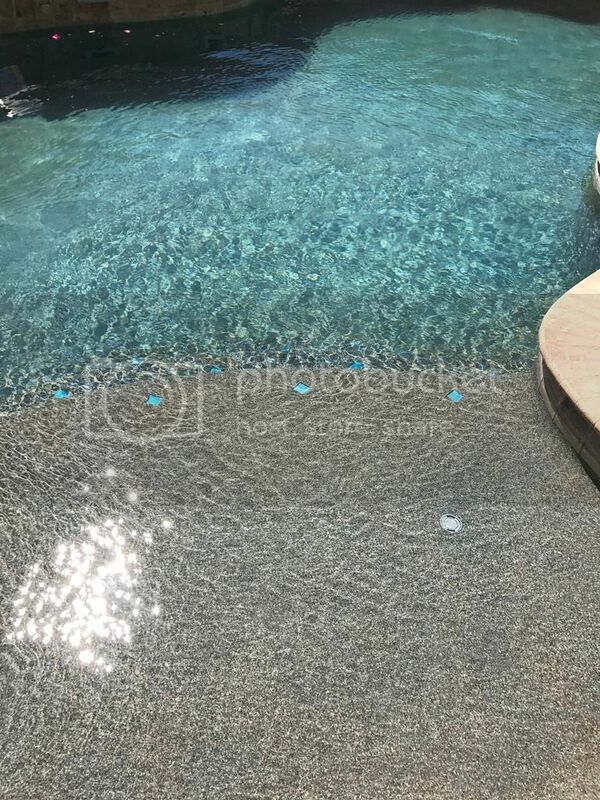 Replacement mineral packs are costly, it adds stuff to your pool water that could prove problematic long term and you just plain don't need it. At a minimum, I'd open it up and remove whatever is inside it. Long term, I would be inclined to aftually cut it out of the loop completely. So I went to get a new o ring before I saw your post and I was standing in line playing with the old one I found little tiny cracks in it. I didn't realize I needed to stretch it a bit to see the cracks. I guess I thought it would be more obvious. Anyway I got a new one and replaced it and it worked like magic. The leaf vac and pump filled completely up, I had 50 gpm going to the cleaning actuator and the heads were popping and working beautifully. But after about an hour I went to check on it and the impeller quit turning and it was back down to about 30 gpm. The leaf vac and pump were still full. I opened them up and now I can't even get them to fill again. I am so discouraged. It is a pool frog on there, I turned it off, or at least thought I did, and never replaced the first pac based on what I read on here after I bought the pool. I just went out and looked at it and was able to get it to go one more click so nothing should be going through now. I have never been able to get the top off to remove the pac tho. I don't know where the pipe going in the ground goes. The valve is after them so can't shut it down either. I did try the shaving cream but just ended up making a mess. I couldn't really see anything happening and none went in the baskets. I did get the cartridges out to clean yesterday but they still look bad. It looked like it had chips of paint coming out of it. It was really weird. I am wondering if this is why the cleaning system isn't working. Good going on replacing that o-ring. After cleaning you said the flow was 50gpm and went down to 30gpm after about an hour. Did you happen to notice what the filter pressure was right after you cleaned it and what it was after an hour (after the flow decreased)? If the pump rpm was the same for both your gpm readings, I would suspect you might be on the verge of an algae bloom. How are you chlorinating the pool? What testkit are you using? Post a pic of your automation panel too. With answers to the above questions and a full set of test results (hopefully from one of the recommended test kits) we can better figure out what's going on. If you've reached your image quota you can either become a supporting member of TFP (see the Support TFP link in the top menu) or upload the images to Photobucket or another image hosting site and lonk them back to here. I got too excited when the darn thing started working and didn't record the pressure. It's sitting at 28 psi now tho. I use liquid chlorine and have a Taylor test kit, thanks to TFP, but I haven't been a good pool owner and so it has languished on the shelf. 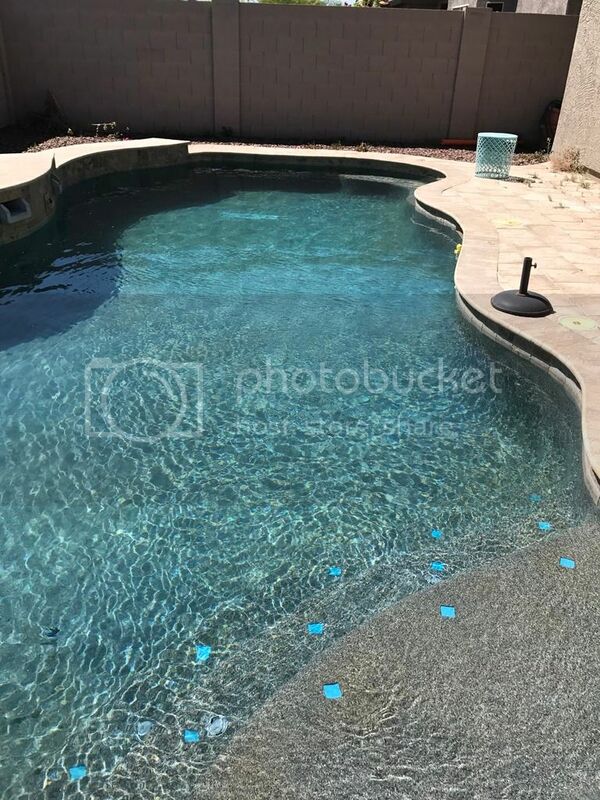 I have new reagents on the way to me tho so I can get some accurate numbers and and try to be the owner my beautiful pool deserves. I will post them as soon as I can. My filter is an s8m600 and it looks like it's not made anymore??? Or at least I can't find much info on it. Every time I look up the part # for the cartridges it says they are for a different model number. So I'm a little confused about that. Thanks for the lead on the Filbur cartridges, kadavis. I know they are super expensive but that what I get for not taking better care of the ones I have. Maybe I will finally learn my lesson when I have to shell out the cash. Sigh. I'm just really irritated that leaf vac won't fill up again and I still have some air in pump basket. I guess I just keep searching for more leaks?? ?